I work with women which means I deal with relationships A LOT! Women are relational beings. Which is why we have a ministry just for women. We need each other. However, for most women when we think of our greatest hurts, they usually involve other women. It’s a sad truth…often as women we allow petty things to negate what we really need from one another and that is friendship. My experience in talking with so many women is that even though they’ve been hurt, they know there are some things that only women understand. Only another woman can understand how a good hair cut and style can affect your mood or the real struggle to find the right black dress. Women get things that men simply cannot. Yet, the enemy attacks these relationships. I agree wholeheartedly with this quote. However, to have a good friend, we have to be a good friend and we have to be willing to MAKE friends. Oh, MAKE friends? I know for some people this is as natural as breathing but for others it’s hard. 1. Never introduce yourself. Okay, that sounds silly but really…how many situations have you found yourself going…”I’m not going to introduce myself to that person, they should come to me and introduce themselves.” or “I could never be friends with that person.”? Hint: If no one introduces themselves to each other…you won’t be friends. You can’t be friends with someone you don’t know their names. All the time, I find the one of the biggest hurdles for women is introductions. 2. Act uninterested. Never asking questions or initiating conversation is a sure way not to make a friend. Really, the only friendship that you are interested in is the one that is all about you and how interesting you are. You can seal the deal if you make sure you have a story that is better than their’s. Sure way to NOT make a friend. 3. Isolate yourself. 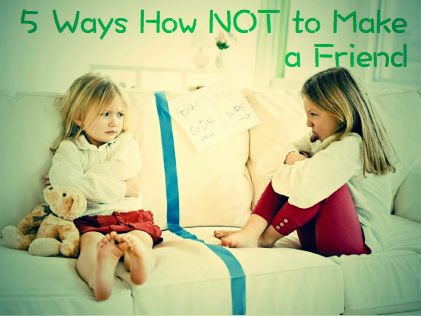 If your goal is to NOT make friends, don’t be around people. Don’t go to events offered. Don’t sit at the table with other women. Don’t put yourself out there. However, if not making friends isn’t your goal attending events, taking a seat with other women and putting yourself out there will likely produce friendship. 4. Be unreliable. If you and your new potential friend agree to meet somewhere, show up late or don’t show up at all. If you realize your ARE going to be late or have a conflict, don’t call them as soon as you realize there is a conflict. These behaviors would be considered rude and would certainly hinder or even kill the possibility of a potential friendship. 5. Never take the initiative. Expect the other person to initiate activities, remember birthdays, and ask how you are feeling. By never taking the initiative the friendship will become unbalanced and uneasy and distance will likely arise. This list sounds a bit dramatic, I know. No one wants to NOT make a friend. However, sometimes we sure act as if that’s our goal. Have you found yourself guilty of any of these behaviors? I have. Relationships require work no matter who they are with. Yes, some are easier than others but each is important and will make a difference in the building of your character and the Kingdom. The world sees God through our friendships with one another. What is the world seeing in your relationships with others? Go be a friend today! Question: What would you add to this list of “How NOT to make a friend”? I’m sure you’ve got something great!